I am literally at the final mission in the game and once again through no fault of my own, the ending has been spoiled for me. I am, however, ready to write the next article in the "In My Console" category. 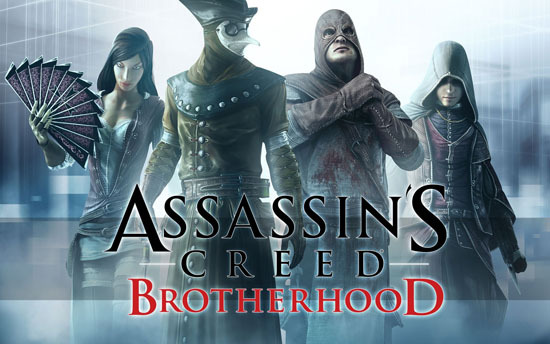 The game that I am going to be reviewing is the action-period piece: Assassin's Creed: Brotherhood. The Story: Ezio Auditore, the protagonist of the second game, has discovered the secret from the mysterious individual beneath the Vatican. He is confused about the truth but is quickly thrust back into battle against the Borgia, the main antagonist family for the game. 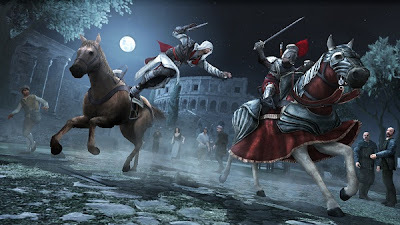 After a surprise attack in Monteriggioni, Ezio, his family and a slew of companions (assassins, courtesans, thieves, mercenaries, friends and civilians) must now rise in their locale, Rome, to take back control of the city, defeat the Borgia family and return possession of the Apple of Eden. (L to R): Rebecca, Desmond, Shaun, and Lucy. The game also focuses on Desmond Miles. The kidnapped Subject 17 from the first game who was rescued by Lucy and brought on the run with her cohorts, Shaun and Rebecca. 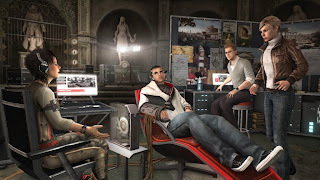 Desmond is reliving all the events through the game from his ancestor's memories before the diabolical company, Abstergo, discovers their new hidden location. Where To Play: The game can be played on Microsoft Windows, PlayStation 3 and on the Xbox 360. Once again for the basis of this review, the game has been played on the Xbox 360. The Good: Even though this game can be classified as a cross between a sequel and a spin-off for the series, Brotherhood has offered more than the previous two games in terms of extras. There is now a new multiplayer addition to the game and for those of you who have read previous posts of mine, you know how much I love having multiplayer in a video game; it adds the continuing play factor. The new addition allows the user to play as an iconic (fictionalized) assassin to compete on assignments and play head-to-head against other individuals. Other extras include the iconic scenery of well-known locations and the ability to purchase them to strengthen the power of the Assassin's Guild. My favourite addition is the ability to recruit aspiring assassins around the city, employ them to fight guards in Rome that are after Ezio, and sending them to complete missions across Europe and Asia. The Bad: The controls have improved from the first two games. However, there were problems when actions didn't orchestrate how I wanted them to while completing a mission, such as running from guards or climbing an incredibly difficult building. Fixed camera angles were a bit of a nuisance, especially in certain locations when you're trying to jump to a support beam or a placement on the wall. I didn't like the half/full synchronization method at first to complete an extra goal. Sometimes the extra goals were redundant and hard to complete in the allotted time. The last issue I had with the game is that the locations were very limited. 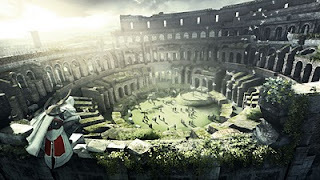 In Assassin's Creed 2, you're able visit a variety of cities across Italy while in this game, it only focused in Rome. The design of the city was beautiful, but the game felt very short compared to the previous installments. 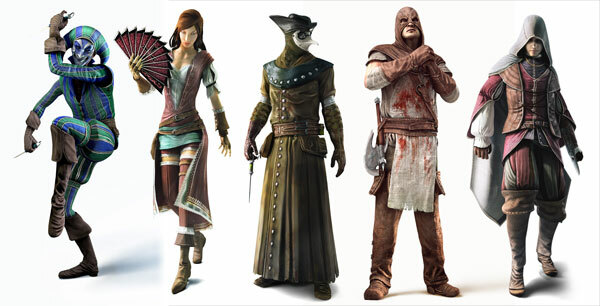 I love the Assassin's Creed series and the continued improvements that the series is making. I just wish that some of the issues were improved upon and that there was more variety to the locations. Multiplayer is a great touch and I loved the overarching story; however, the experience felt shortened compared to previous installments. 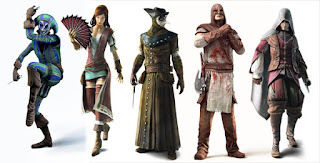 The game sometimes felt like an expanded DLC (downloadable content) that could have just been download and added to AC2. However, the purchase as a stand-alone game was worth the buy and subsequent play for all the extras and the continued story in Rome.